The Yankees’ formula for victory Wednesday night was simple: The sluggers homered and the top pitchers delivered key outs. It took just two hitters for the Bronx Bombers to slug the A’s, and they rode that early momentum to a 7-2 victory over Oakland and a second consecutive wild-card game triumph. Aaron Judge electrified Yankee Stadium by homering off A’s “opener” Liam Hendriks in the first inning to give the Yankees a lead they would not relinquish. 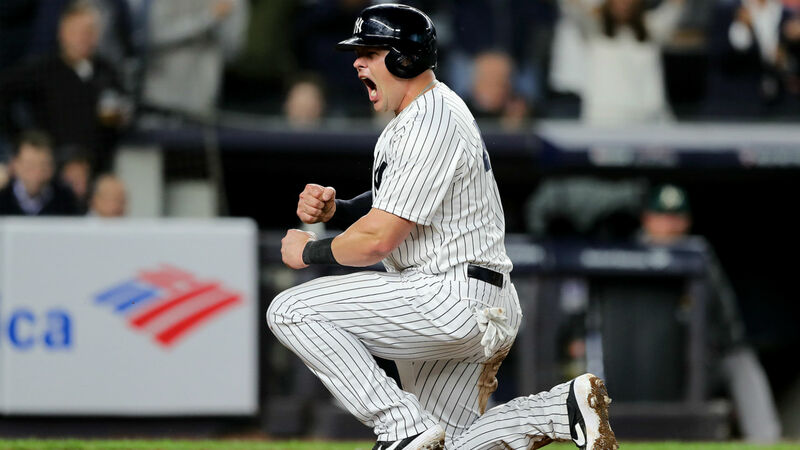 Luke Voit’s two-run triple in the sixth, which nearly sneaked over the right-field porch, and Giancarlo Stanton’s towering home run to left in the eighth put the game on ice. Both hits came off A’s All-Star closer Blake Treinen. Luis Severino got the start for New York and greatly improved on his 2017 wild-card performance when he lasted just one-third of an inning. He lasted four-plus frames this time, giving up his first hit of the night in the fifth inning. He struck out seven and walked four. Dellin Betances followed, got out of a jam, and ended up retiring all six hitters he faced. The only blemish on New York’s bullpen was a two-run home run by Khris Davis off Zach Britton in the eighth. The loss marked a disappointing end to Oakland’s surprise season after the A’s charged back from being eight games out of a playoff spot to start July. Oakland has now lost its last eight winner-take-all playoff games. 11:31 p.m.: Chapman strikes out pinch hitter Mark Canha as “We Want Boston” chants surround Yankee Stadium. Two outs. 11:20 p.m.: End of the eighth inning. Familia retires all three hitters he faces and the A’s will have their last opportunity in the ninth. They need five runs to tie, six to take the lead. 11:17 p.m.: Treinen’s night is done. He allowed three runs in two-plus innings. He exits in favor of Jeurys Familia. 11:05 p.m.: A’S SCORING PLAY. Khris Davis homers to the short porch in right field and the A’s are starting to chip away. It’s 6-2, Yankees. 11:03 p.m.: Jed Lowrie hits into a double play but the A’s are going to challenge, saying Lowrie beat the throw at first. The call is quickly overturned and Lowrie remains at first. 11:01 p.m.: On the night the Orioles fire manager Buck Showalter, Zach Britton enters a wild-card game. He’s greeted by Matt Chapman, who hits a leadoff single. 10:58 p.m.: End of the seventh inning. Judge walks but Treinen gets Hicks to pop out. The A’s have just two more chances to make up a six-run deficit. 10:34 p.m.: End of the sixth inning. The Yankees’ fourth-run sixth has broken this game wide open. 10:30 p.m.: YANKEES SCORING PLAY. Didi Gregorious hits a sacrifice fly to drive in Voit. It’s 6-0, Yankees. The play was under review to determine whether Voit was tagged out before touching home, but he is ruled safe. 10:07 p.m.: The A’s go down in order. Betances has retired all six hitters he has faced. 9:59 p.m.: End of the fifth inning. The Yankees get nothing after the Andujar single. Both offenses have been very quiet. It’s still 2-0 in favor of the Yankees. 9:53 p.m.: Shawn Kelley is the A’s third pitcher of the night. Miguel Andujar starts the bottom of the fifth with an infield single. 9:42 p.m.: Martini singles to right field and Aaron Boone pulls Severino in favor of Dellin Betances. The A’s have runners on first and second with no outs. 9:39 p.m.: Jonathan Lucroy singles to left field and the A’s have their first hit. Severino is at 82 pitches. 9:24 p.m.: Piscotty flies out but Laureano walks and the A’s have the bases loaded with two outs for Marcus Semien. 9:17 p.m.: After Severino retires the leadoff hitter, an error and another walk move a runner into scoring position. Still no hits for the A’s, but they have drawn three walks. 8:33 p.m.: Matt Olson walks with one out in the second. He’s the A’s first baserunner of the game.